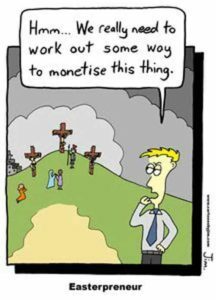 Jim’s Easterpreneur cartoon made me smile. For a split second, I thought I knew what it meant, momentarily forgetting that no creative work about the crucifixion is likely to be that easily tamed. Hoping for inspiration I carried it around in my diary but the wretched thing just kept slipping out of my grasp. Sometimes with the contents of my voluminous and overstocked handbag as the whole mess hit the floor. Other times it just loomed in my mind’s eye daring me to have another go before fading back to black. A bit like Easter itself. I grew up with crucifixion stories grounded in the ancient tradition of blood sacrifice. The idea is that Jesus, the central figure in Christianity, is sacrificed and his blood allows me and other sinners entry to heaven while bypassing hell and all its torments. That’s hard to make sense of but the story has been a money-spinner. Long before Jim’s cartoon, the church sold indulgences, a kind of get out of hell free card. The profits were said to greatly benefit the building of St Peter’s in Rome. However, once we began to see our world as part of a universal solar system the game was up. Heaven and hell couldn’t be literal places. Literalism aside, the long road to Calvary unfolds every year with the week leading up to Good Friday setting the scene. Black cloths cover crosses in church, flowers are removed and altars are bare. Long vigils inch along with hardly a word being spoken and if there is music it’s all rather sombre, deep, dark and all about death. Theatrically it’s a godsend but in New Zealand, where we have an aversion to talking about death, it’s largely ignored in favour of Easter eggs, an appealing symbol of new life and a sure money-spinner for Nestle and friends. Death plays a big part in my life, a result of working in a hospital and hospice. It’s life-enriching to walk alongside people who accept they are dying because there’s honesty there, often missing in lives that imagine they have eternity at their fingertips. All that fuss and bother about being a success in the world fades away as though the ego has to die or be re-formed before the body has its turn. It makes me wonder whether the crucifixion story, the journey to the grave, is about the convoluted journey to our interior, where our deepest, darkest fears are held. Perhaps it’s trying to tell us that to become enlightened, to see life as it really is, we have to become vulnerable, crucified, exactly what we don’t want to be. As we relearn how to read mythology as an art form of deep significance we need people like Jim to bring us new ways to see ancient stories, to push our boundaries about what we thought we knew. The Easterpreneur is going to be disappointed in terms of profit margins but maybe that’s what Jim was talking about all along.